Please refer to our stock # DSC19 when inquiring. 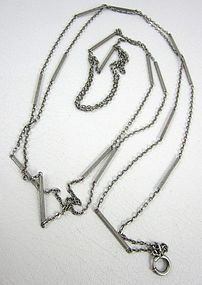 This lovely antique watch chain measures 52" long and is handcrafted from sterling silver. It has 7/8" long etched bar segments and the end terminates in an old style spring ring closure. It is in excellent condition and would be great with a watch pendant or loupe.